In this tutorial I will explain how I built the softbox used to take the image on the left. 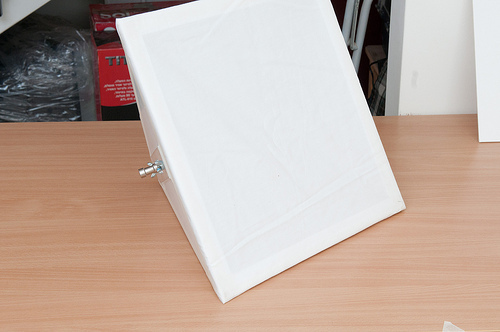 It is a 40cm X 40cm foamboard softbox that accepts a strobe. Kinda similar in size and effect to the Photoflex LiteDome XS which I use a lot out of the studio. 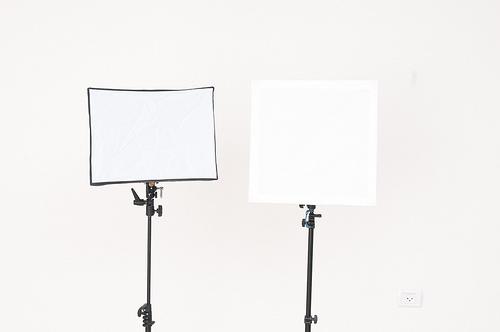 On the left image this softbox was used as key, see this lighting setup for another use of the softbox as fill. 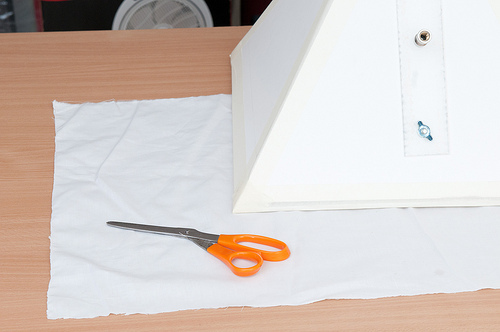 It is a simple softbox to make and it takes about half an hour if you have mediocre cutting skills. Here is a list of the materials, the entire thing should not cost more than 10-12 USD. 3 1/4 20 nuts and bolts – you can get ’em cheaper than amazon on your local stores. 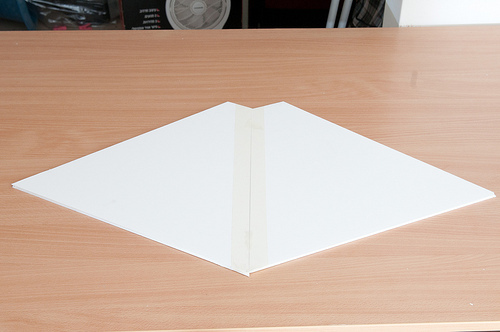 The first thing is to make 4 foam board trapezes. The front sides are easy they are all 40cm long. 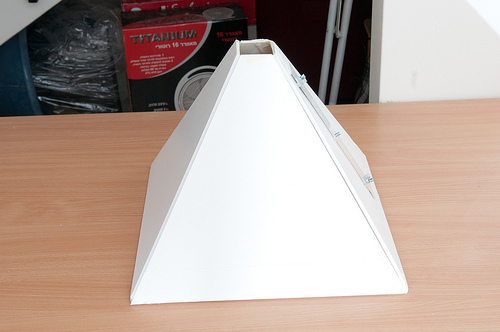 The strobe sides should be base side is easy – they are 40 cm each. for the strobe side (an SB800) I did two parts of 4cm and two parts of 7cm. The height on all four is 35 cm. Once we assemble the box, we have no access to the interior, so we take one of the long sides and attach a mount. In the end, this will mount on a swivel stud. 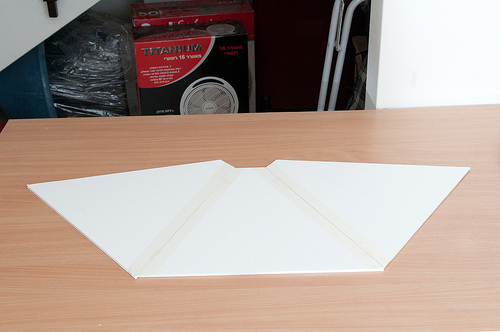 However, we need to reinforce the foamboard. 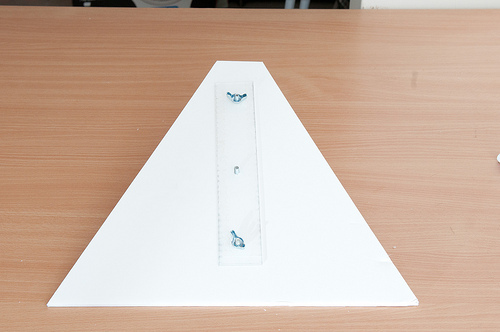 I chose to use perspex to add some sturdiness to the bottom – plywood will work just as well. 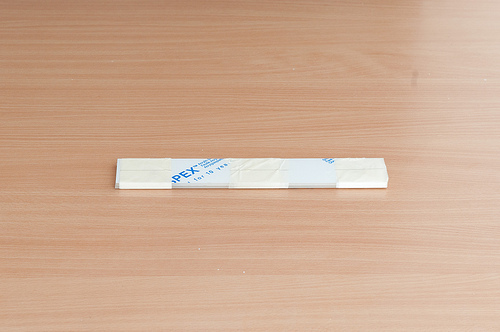 Attach the two strips together using tape – This will help insuring that the holes are aligned. Make three holes at 5, 12.5 and 20 cm. 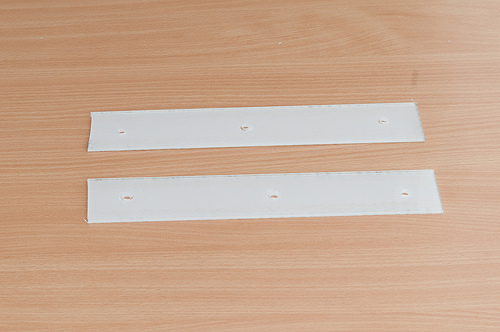 Since the two perspex pieces are bonded together, the holes will be perfectly aligned. 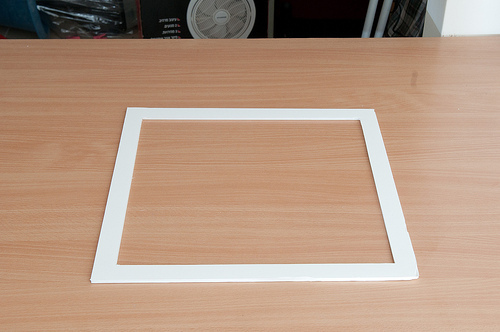 The first thing is to do is to tighten the Perspex (or plywood) on the two sides of the foam core using two nuts and two bolts on the far ends. The bolt that goes in the middle does not get a nut – it will be screwed to the stud on a swivel (god, that last sentence sounds weird). and complete with the reinforced bottom to make a pyramid. 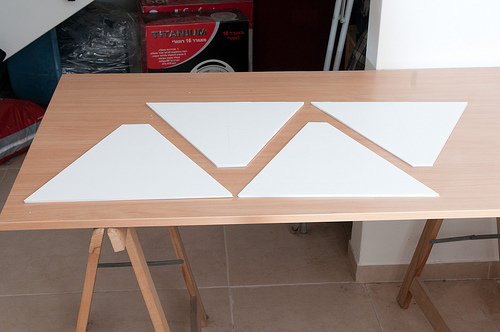 at this stage, you have a wobbly pyramid that kinda reminds a softbox. To give it the structural integrity it needs (to withstand Klingon attacks) you will need to add a frame. 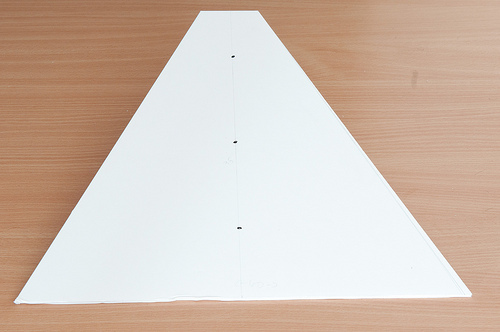 Start by placing the pyramid on a foamboard and trace the external square. Make a second square 3 centimeters deep inside the first square and cut. Tape the face to the “base” of the pyramid. On the image on the top you can already see the attached stud from the swivel used. To finish off, here are the two boxes side by side – the Photoflex LiteDome XS and my DIYed box. 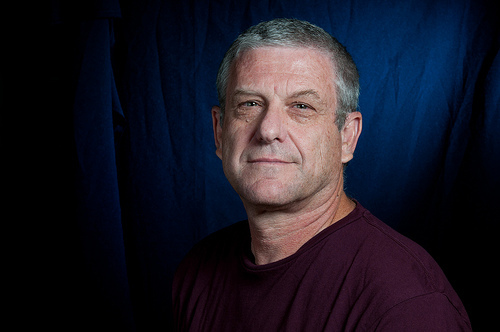 One thing to note about those DIY softboxes is that they do not spread light in an even way – If you take a close look at this portrait’s catch-lights, you’ll notice a hotspot on the left catch-light where the box was used as fill. Here is the first portrait again just a bit bigger, and the setup that was used to take it. 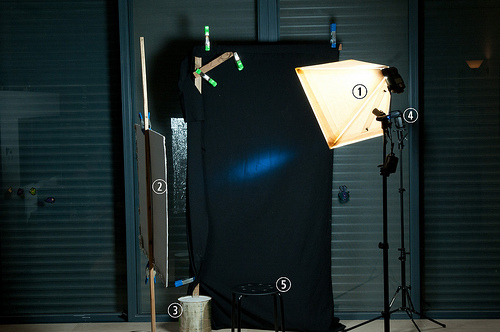 2 – A foamboard silver reflector mounted on a stick-in-a-can provides fill from the left side. Featured Comment by Rick: I would recommend doing this project with white&black foam board (white on one side, black on the other). Construct it so the black is facing outward, then you’ll have less spill contamination on the scene, which could be important if you are shooting in a lightly color room and want to make the non-lit subject areas pretty dark. My suggestion for the base/face is not on the end where a lip is blocking some of the internal light. I believe you’ll get a nicer feathering of the light by place the reinforcing square on the outside of the box. 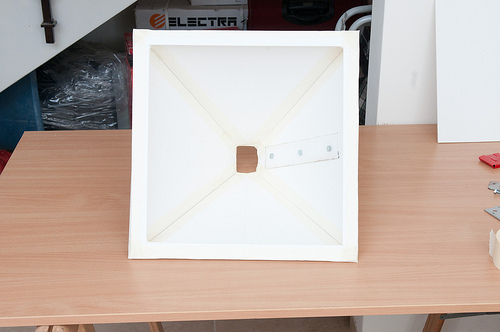 It would also give you a place to put clamps to hang different fabrics over the opening.